Remove orange protective cap and insert cartridge into your printer. 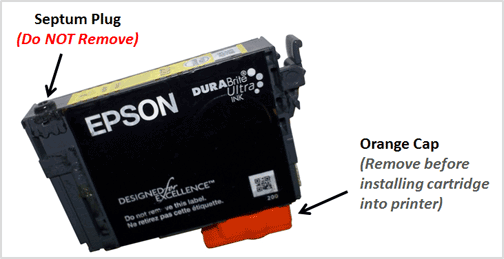 NOTE: Epson 200-I (initial or introductory version cartridges) are not supported for refilling. The chips on these cartridges cannot be reliably reset and ‘unrecognized cartridge’ alerts may result, therefore we do not refill 200-I cartridges. However, the majority of in-store retail ink refill labs will refill Epson 200 regular and 200XL (high capacity) cartridges for refilling. Your printer/computer may display an ink alert message, such as “non-genuine cartridge”. Press proceed/continue/accept/yes/OK to dismiss this prompt. In some cases you may have to scroll over using the printer’s arrow keys to dismiss the alerts. Additional alerts may be displayed the first time you go to print or copy – dismiss the alerts accordingly to resume normal print operations. ATTENTION: If you had a cartridge refilled, and upon installation into the printer, you immediately observe “Unrecognized Cartridge” or “Replace Cartridge” error message (Red X) appears return the ink cartridge to the refill store to have the cartridge re-programmed and weighed. NOTE: When empty, refilled Epson 200 & 200XL cartridges will display “Ink cartridges cannot be recognized” or “Cannot Recognize The Following Cartridges….Try Installing Them Again” alert messages (…only occurs when the cartridge is empty – this is COMPLETELY NORMAL behavior for refilled T200 ink cartridges which are completely out of ink). Return cartridge for refilling when this occurs. See video below for more information. 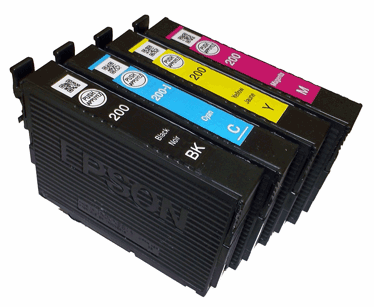 Epson T200 & T200XL (high capacity) ink cartridges support Epson Expression Home XP-200, Expression Home XP-300, Expression Home XP-310, Expression Home XP-400, Expression Home XP-410, WorkForce WF-2520, WorkForce WF-2530 & WorkForce WF-2540 printers.